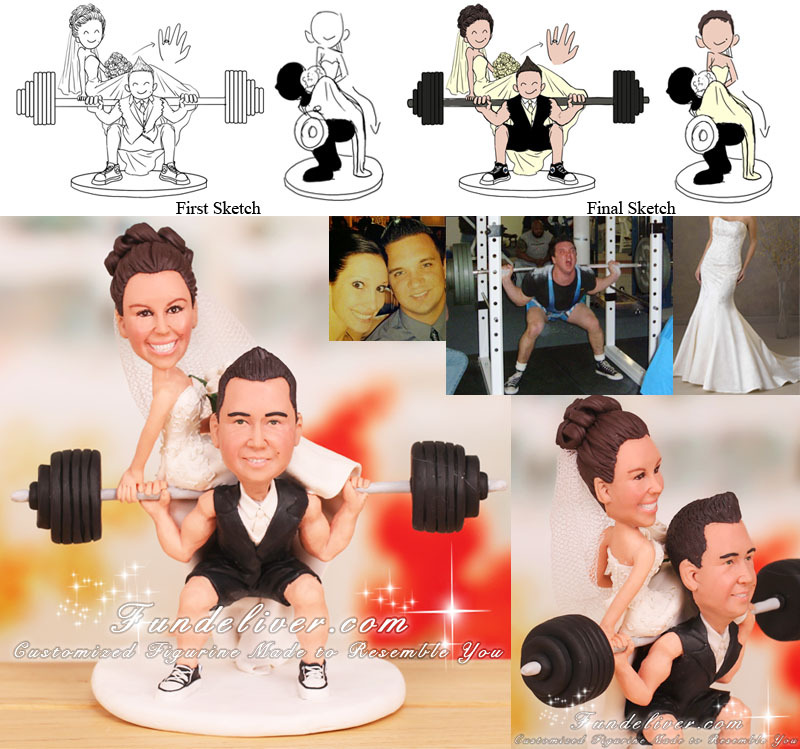 This is a completely customized groom in squatting position bride sitting on barbell powerlifting wedding cake topper ordered by one of our customers. I'm so excited I found your website! My name is Kelly and I've known my fiance, Shaun, for over 10 years now and we were always close friends but always in long relationships with other people and were never both single at the same time to give US a try until now! It’s like a fairytale, marrying someone you have known so long and has always been so wonderful to you! That's why I really wanted to do something special and surprise him with this cake topper! He is an engineer and works very hard but in his spare time he trains and lifts in meets as a powerlifter! I am so proud of him!! Right now he is ranked 70th in the whole country for his deadlift of 625lbs at 198lb weight class in powerlifting USA magazine. 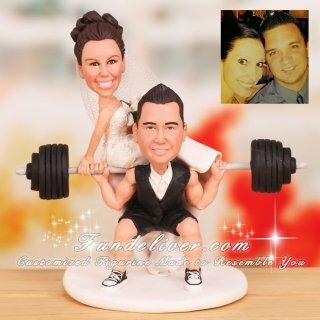 What caught my eye was that bodybuilding cake topper you had done with them holding the barbell. Not to take anything away from bodybuilders but Shaun and his friends always say "they stand on stage and flex in a thong we actually lift the weights to win our trophies!" Haha so I was thinking of the 3 events he competes in, deadlift, squat and bench press that squat would be the easiest and most fun to mold a cake topper into! I'm going to email several extra pictures and since it is a surprise it’s hard to find/take pictures without him knowing but let me know if you need any better angels or anything else and I will do my best to get those to you. The basic idea I had was to have him in a squatting position with the barbell on his shoulders and me in my wedding dress sitting on the barbell making it heavier for him to press up. If my dress is too wavy in front with my knees over his shoulders maybe I could be sitting the length of the bar with my legs behind his head sitting sideways I'm not sure that's where you come into play! But I would still like to see the weights on the bar and not cover his outfit up too much but still have me as a main focal point too! I would love it if it could be as detailed as possible even put chalk on his palms and on the bar too! Since this is something we will treasure forever and keep it displayed I would love it if you could make our faces resemble those of "K & S favorite picture" which I will send in the email. His lifting faces aren't the most handsome ones and he always has to look up so if both our faces could be looking forward and smiling that would be ideal!! Also in a lot of the pictures he looks extra chubby in powerlifting you gain weight and gain strength and the cut back before a meet so he isn't at his leanest right now so if you could please refrain from making his face look too chubby he is quite sensitive about it! He looks best in our "favorite picture"! I would love if he could be wearing his chuck taylor converse shoes in the clay model with no socks showing please he looks silly when he does that. And I was thinking to get the full affect of the lift itself and to tie along with the wedding maybe he can be wearing shorts that are black and resemble that of tux pants so you can see his knees and his shoes they should be slightly above the knee as for the top I would love if you could do a light ivory satin looking vest and tie (my dress is a very pretty satin light ivory not the yellow looking kind) with a black jacket over but nicely cut off at the shoulders? So you can see his arms holding the bar? Now the serious part, the weights! He currently squats 550 (the bar weighs 45, so 10 plates of 45lbs (5 on each side)2 plates of 25lbs (one on each side) and 2 plates of 2.5lbs (one on each side) gets us to a grand total of 550! Clearly the weights don’t have to have the numbers of lbs on them us and his friends will know by looking at them but try to make all the 45lbs larger and then the 25lb smaller and the 2.5lb really small! As for me I absolutely love my ring it was such a surprise and he picked it out all by himself its 2.3 carets in a high Tiffany setting so if somehow you can have either my hands folded with it showing or me holding just a plain small ivory rose bouquet with my ring showing that would be perfect! I would love my hair up in curls with a lot of volume since I have a slender face I think the large curls would be ideal my favorite is the "hairstyle 1" with my veil underneath. I would like to have my dress on the top, it is a nice sweetheart neckline and very detailed and then slowly fades to plain satin around the waist/hips I sent full pictures of the dress as well as the detailing on it. I love the buttons in the back of the dress and since my hair will be up if you could please add those in as well. Shaun and I love his unique 40s style hair if you could please pay extra attention to make that as accurate as possible too! I sent a "Shaun good hair pic". Oh I almost forgot we've known each other so long when we first actually started dating we just then discovered we have the same exact beauty mark on our left cheeks very close to our lips you can see his best in "Shaun 1" and mine in "Kelly 1" they are pretty beauty marks medium brown if you could include those but not too dramatic I don't want them to look like large black moles! I do have very dark brown eyes I selected brown for brides eye color but please use your discretion if you think closer to a black brown would be better! I think that will do it! I know that is a lot of detail and information and I seem very picky but I just want it to be perfect and something we will cherish and keep on a shelf in our dining room and see every day and smile! Thank You So much!! This will be a wonderful surprise for Shaun!